Voting on resolution condemning violations of human rights and fundamental freedoms by the Syrian authorities. The top United Nations human rights body today deplored the “brutal” actions of the Syrian authorities in response to the popular uprising that began nearly a year ago and called for an immediate end to attacks against civilians and other abuses. In a resolution adopted by a vote of 37 in favour to 3 against, with 3 abstentions, the 47-member Human Rights Council strongly condemned the continued “widespread and systematic” violations of human rights and fundamental freedoms by the Syrian authorities. These include the use of force against civilians, arbitrary executions, the killing and persecution of protestors, enforced disappearances, torture and sexual violence, including of children. China, Cuba and Russia voted against the text, while Ecuador, India and the Philippines abstained during the vote, which came at the end of an urgent debate held by the Council on the situation in Syria. In the resolution, the Council deplored the “brutal actions of the Syrian regime over the past 11 months,” and reiterated the need to urgently address humanitarian needs, to facilitate the effective delivery of assistance and to ensure safe access to medical treatment. It called on the Syrian Government to immediately put an end to all human rights violations and attacks against civilians, to cease all violence, to allow free and unimpeded access by the UN and humanitarian agencies to carry out a full assessment of needs in the city of Homs, which has been under severe attack for over a month, and other areas, and to permit humanitarian agencies to deliver vital relief goods and services to all civilians affected by the violence. Speaking after his meeting with former Secretary-General Kofi Annan, the newly-appointed Joint Special Envoy of the UN and the Arab League for Syria, Mr. Ban stressed that there is no more urgent task before the international community than to immediately end the killing. “We seek a cessation of violence that sets the stage for a peaceful solution – a solution that offers all the Syrian people, regardless of religion or ethnicity or political affiliation, a future of security, dignity and freedom,” he stated. Mr. Annan is slated to hold further discussions this week with UN officials in New York, following which he will travel to Cairo, Egypt, to meet with Arab League Secretary-General Nabil El-Araby. Meanwhile, UN Emergency Relief Coordinator Valerie Amos is still awaiting permission from the Syrian authorities to visit the country to assess the humanitarian situation and renew the call for urgent humanitarian access. Council members deplored the rapidly deteriorating humanitarian situation and called on the authorities to grant Ms. Amos immediate and unhindered access to the country. 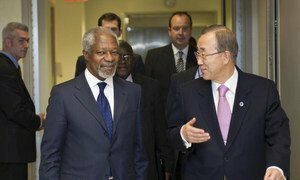 Secretary-General Ban Ki-moon and Kofi Annan have held talks today to discuss how the newly appointed Joint Special Envoy of the United Nations and the Arab League for Syria can help to end the deadly violence gripping the country and find a peaceful political solution.